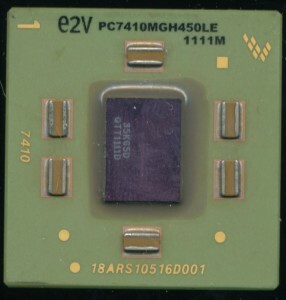 The pictured PowerPC 7410 processors are packaged in a HiTCE package. HiTCE is a package designed to have a higher Thermal Coefficient of Expansion then the standard Alumina ceramic packages, meaning that when heated it expands more. TCE is measured in ppm (parts per million) per degree Kelvin. Typical alumina ceramic packages have a TCE of 7 and this is where problems arise, especially in high reliability applications and wide temperature ratings. 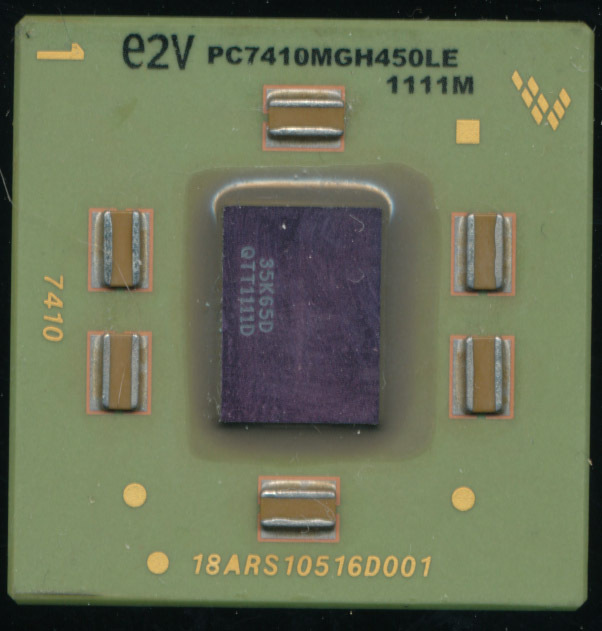 This PowerPC 7410 is spec’d for a military temperature range of -55C-125C, which is a 180C temperature swing. Part of the rating is: will the processor perform to spec over that range of temperature, will it meet all the values specified in the datasheet, timings, voltages, current, etc. and will package itself handle those temperatures without failing. There is, however, another consideration, What is that processor mounted to? 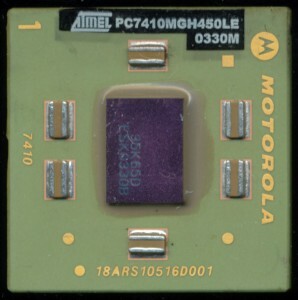 Typically its soldered (its a BGA device0 onto an organic PCB called FR-4. This is where the problem shows up, FR-4 PCB also has a rated TCE, but in this case its around 12-14, it expands significantly more then a ceramic chip. Its this difference that causes problems. On a larger chip, over a wide temperature range this can cause mechanical failure, shear stress on the balls will break them free, with obviously bad results. Worst case, 180C temperature swing, from 7-14 TCE results in a difference of 1260 ppm (aprox 0.13%). On through hole devices (such as a DIP) the long leads can take this difference, there is plenty of room to flex without breaking. IBM uses CGA (column grid array) to essentially elongate the balls of a BGA device to allow more deflection before failure. Other companies use double BGA (with 2 balls stacked to do the same thing). Organic packages can of course be used as well, but they do not have the mechanical reliability, or thermal characteristics as ceramics. Ceramic boards can be used as well, but that is very expensive to do. Thus the invention of HiTCE packages, which are a way for ceramics to be made with a higher TCE, that is much closer to that of the PCB they are mounted to, this largely solves the expansion mismatch, while keeping all the benefits of a ceramic package. The e2v HiTCE package has a TCE of 12.3, which is right in the range of most PCBs, allowing a BGA device to be used in a high reliability application, without fear of failure. « I Just Poured Water on my Scanner….